Isn’t preparation the key to everything? You’ve talked about why drivers should learn to drive a stick shift: you’re more in command, you can avoid up-charges at car rental counters in foreign countries, it makes you a more in-tune driver. Plus, it’s a lot of fun. But then there are the reasons NOT to learn to drive a stick shift, which I admit, I considered before I learned (and acquiesced): I don’t want to, I don’t really need to, the person teaching me was shouting at me, I thought we’d be killed in traffic when we stalled. But for me, it came down to staying home or having a social life, so driving a stick was a necessity. If you want to learn, or want to teach someone, here are some tips to make it an easy, shout-free experience that will also teach the new-to-stick driver how to love driving a manual. 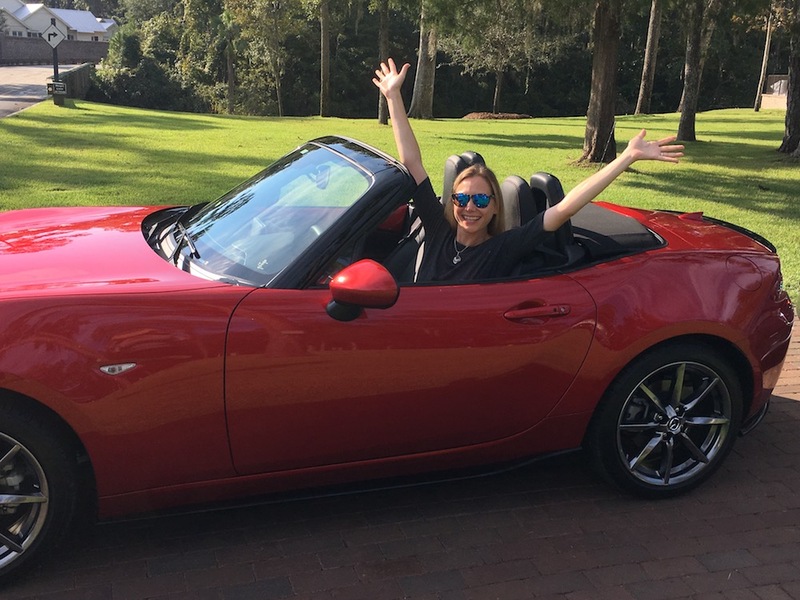 I had the chance recently to teach my friend Kim Tate to drive a Mazda MX5 6-speed. And, I might add, she did great! Real world driving and parking dynamics, such as a parking lot or shopping center will help you learn to stop at an intersection, pull into and back out of a parking space and follow other rules of the road. The three pedals (clutch, brake and gas), the gear shift (and the gear pattern) and the parking brake (either a hand brake or an electric parking brake) are key to driving a manual. Learn how to put the car in reverse; not all manuals have the same reverse pattern or process (for instance, some have a ring you pull up with your fore and middle fingers as you grab the gear shift, others push down, and yet others have a spring that separates reverse from driving gears). The hand brake is really important because the car has no “park” gear like an automatic; when parking a manual transmission car, always put it in first gear and pull the hand brake after shutting off the engine. If you don’t, the car might roll away. 3. Which feet do which job? Left foot is always—and only—for the clutch. Right foot alternates between the brake and accelerator, just like an automatic transmission. Since the driver’s left leg is constantly in use while driving a stick shift, make sure the seat is close enough to get the clutch all the way to the floor but not so close that you’re bumping your knee against the dashboard. Before starting the car make sure to get a feel for this new equipment; it won’t be second nature so you’ll need to practice before starting off. Put the clutch all the way to the floor, and with the clutch in, shift through all the gears so you know where each one is. Some cars have an indicator light on the dashboard that signals which gear you’re in, but most don’t, so learning where they are is important. The gearshift in the Mazda 3 illustrates the gear pattern; neutral is the center position between gears. Neutral is important for idling (and not keeping your foot on the clutch), for times of doubt, braking and of course, NOT leaving a car in neutral when parked. When in doubt, put your foot on the clutch; this will help to reduce engine power, keep the car from stalling out and put you back in control. You know, that ‘other’ gauge with numbers from 1-1 (x 1000) and labeled RPM? That’s the tachometer and it’s also a guide to when to shift gears. But you can rely on listening to the engine, too. Only after learning to drive a stick did I learn what the tachometer measures (engine speed, or RPM: revolutions per minute); I was taught to listen to the engine to know when to shift gears. When listening to the engine, when it gets to low to mid-roar, it’s time to shift to a higher gear; once you get to your cruising speed, the highest gear will keep your engine running efficiently, using the least amount of gas. And if the engine is too quiet or is unresponsive when giving it gas, you need to downshift to a lower gear (the tachometer reading will probably be low, in the 1,000-2,000 range). Make sure to note the red zone on the tachometer. If the tachometer’s needle crosses the red line, the engine may be suffering damage; if that happens, either shift to a higher gear or put your foot on the clutch to protect the engine.